That ole ‘onest huntin’ man. Swain has kilt another turkey hent. 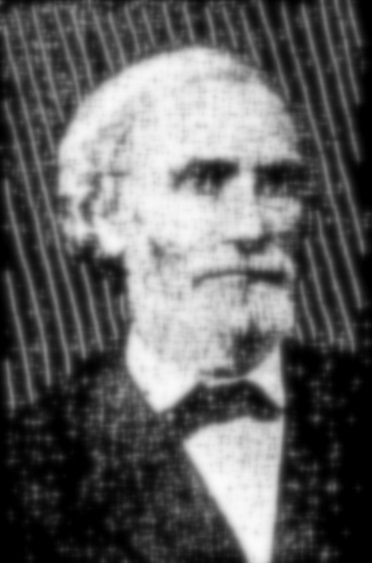 Levi J. Knight described the fight to the governor, who later commended Knight and his comrades for their bravery. Knight wrote that both Enoch Hall and Hamilton Sharpe were in charge of companies of militia. 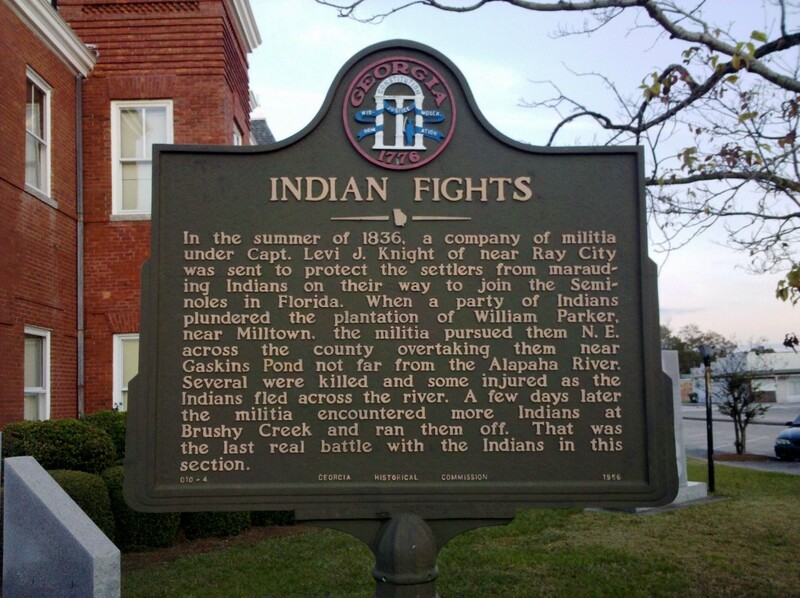 In the course of tracking the Indians through Lowndes, fifteen men commanded by Captain Sharpe formed a battalion with thirty-one men from Thomas County after they discovered Indians in the fork of the Little River and Big Warrior Creek. Following the trail for three miles down the east side of the river, Sharpe and his soldiers encountered about sixty warriors and their families. In the ensuing fight, Captain Sharpe lost one man, Mr. P. Folsom, and one wounded, when he was forced to retreat. 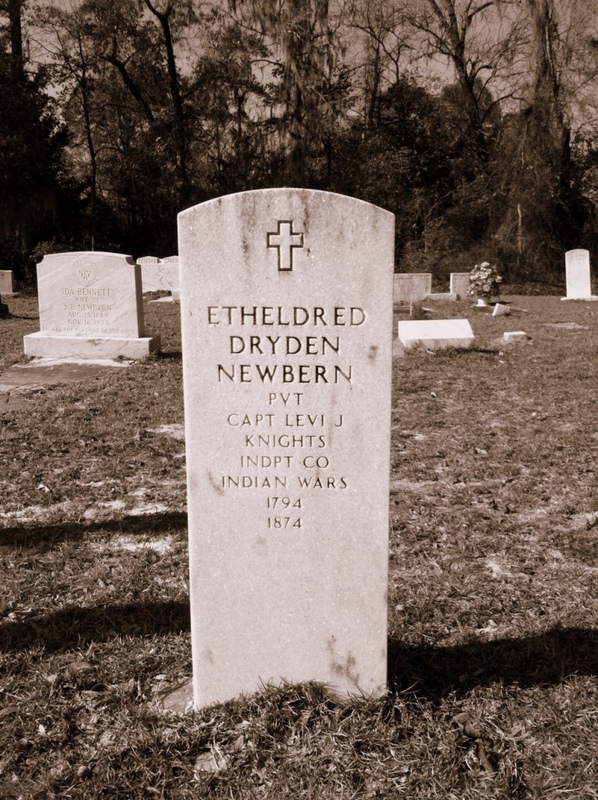 Reinforced by the remainder of the battalion, the Lowndes men pursued the Indians for another three miles and found them on a pine ridge, their rear protected by a cypress pond, and in their front a wide, open, boggy meadow. 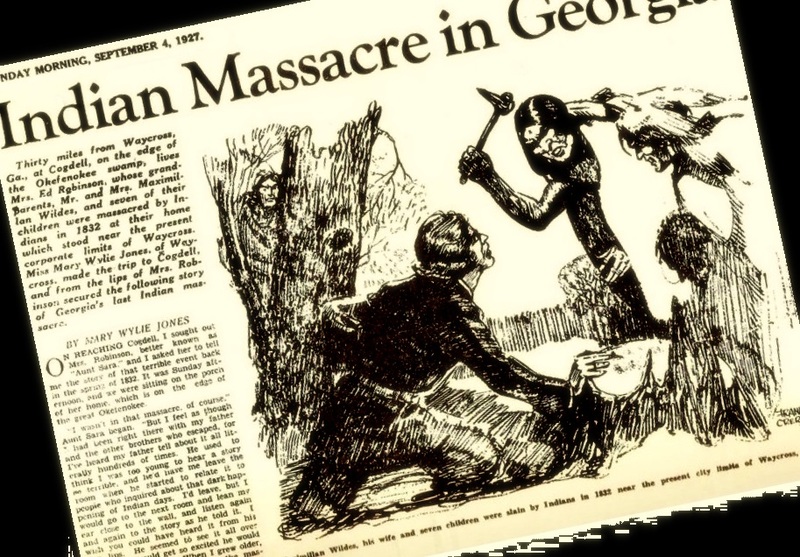 A general engagement commended about 9 o’clock a. m. and after a severe fight for two hours, the Indians were completely routed, with a loss of twenty-two Indians and two Negroes killed, that were seen, and many wounded. 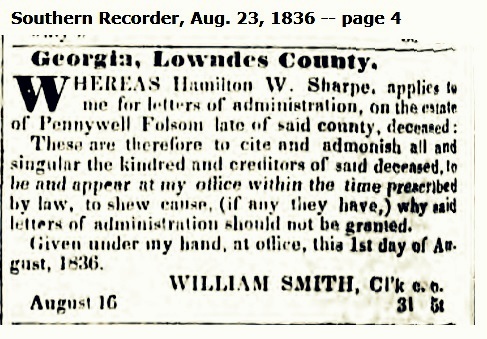 Of the militia, Bartow Ferrell of Thomas County and Edwin D. Shanks of Lowndes County were killed and nine wounded. Norman Campbell, John McDermott, Robert N. Parrish, Pennywell Folsom, Ashley Lawson, Edwin D. Shanks, West Roundtree and others were among those going to the battle from around Troupville. Knight’s Company and other militia units would continue to pursue the Indians across Berrien county. A few weeks later, the militia caught up with an Indian band in southeast Berrien county at a place called Cow Creek. Pennywell Folsom no longer lies alone in deep Georgia woods. 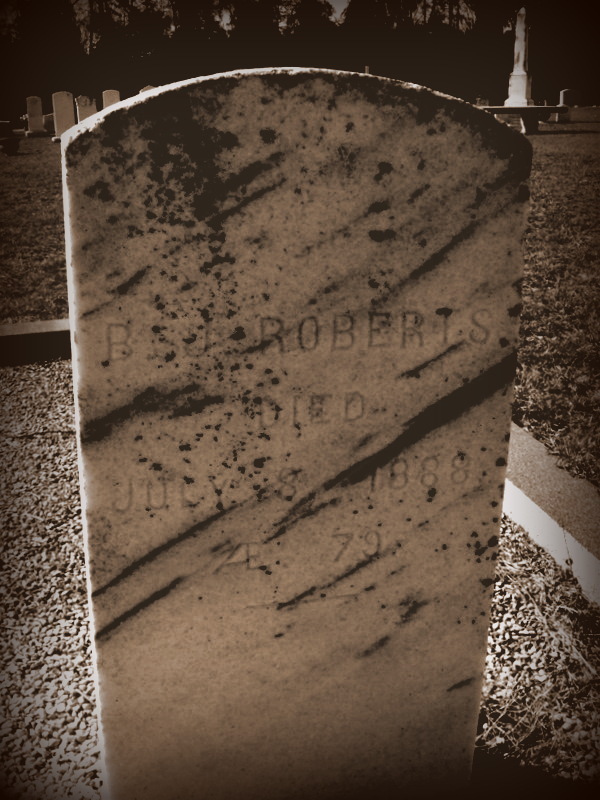 Around his grave, the Rountrees placed their own dead, until this burying ground became known as the Rountree Cemetery. This cemetery is located in present day Cook county , on Evergreen Church Road (CR 99), near the intersection with Rountree Bridge Road (CR 251) (see map). Around 1945, the present Evergreen Church was constructed adjacent to Rountree Cemetery, the original church building located on Rountree Bridge Road having been destroyed by fire. 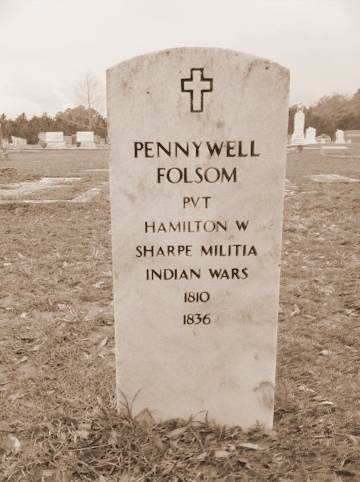 Pennywell Folsom was born in 1810 in Hawkinsville, GA. He was a son of Edith Pennywell and George Folsom. His father served during the War of 1812 in the Georgia Militia under Captain Allen Tooke builing forts on the frontier of Pulaski County to defend against Indian attacks. Captain Hamilton Sharpe administered the estate of Pennywell Folsom, killed under Sharpe’s command at the Battle of Brushy Creek, July 1836. These are therefore to cite and admonish all and singular the kindred and creditors of said deceased, to be and appear at my office within the time prescribed by law, to shew cause (if any they have,) why said letters of administration should not be granted. Given under my hand, at office, this 1st day of August, 1836. Norman Campbell was one of the last surviving participants in the July, 1836 Battle of Brushy Creek, widely regarded as one of the last skirmishes with Native Americans in Berrien county. Earlier, Levi J. Knight led an action against Indians at the residence of William Parker, on the Alapaha River (see Martha Guthrie: Babe of the Indian Wars.) 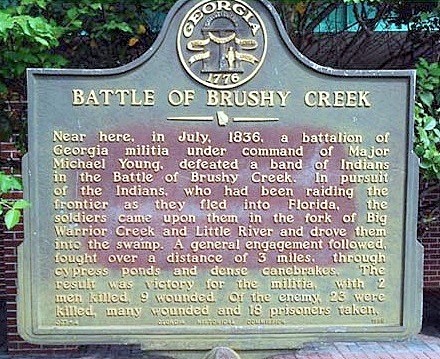 Following the fight at the Parker place, Knight and his troops had marched to join the engagement at Brushy Creek, near Adel, GA, but arrived only in time for the final salute fired over the graves of those settlers killed in the engagement. After weeks of pursuit, Knight and others caught a band of Indian entering the Okefenokee swamp and fought the Skirmish at Cow Creek, near Statenville, GA.
“The Creek Indians were on their way from the west to Florida. NOTE: Campbell’s identification of “Howell” as one of the dead is believed to be a reference to Burton Ferrell.